Australian PM Malcolm Turnbull is meeting security chiefs following the recent killing of a police worker in what officials say was a terror attack. Australia's police head earlier warned the terror threat was getting worse, saying a 12-year-old boy was being monitored in relation to the attack. Police accountant Curtis Cheng, 58, was shot dead on 2 October outside his office in Sydney. Police shot dead his attacker, 15-year-old Farhad Jabar, at the scene. Jabar, an Australian born in Iran and of Iraqi-Kurdish heritage, is reported to have shouted religious slogans as he killed Mr Cheng, a police accountant. 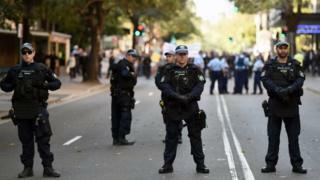 More than 200 officers later raided several properties, detaining four people in relation to the killing in Sydney's Parramatta area. They were all males aged between 16 and 22, officials said. Mr Turnbull is holding the meeting with top intelligence and police officials - as well as senior education officials - in the capital Canberra. Opening the summit, he said the recent attack proved that radicalisation was spreading among the country's youths. "We are dealing with an evolving threat. The shocking murder of Curtis Cheng, the shocking act of terrorism perpetrated by a 15-year-old boy reminds us yet again that radicalisation, extremism can be seen in the very young. "This is a real home grown threat. And it appals all Australians, and it appals all Muslim Australians," he said, adding that engaging with the Muslim community "is absolutely critical". "The most critically important Australian value in all of this is that of mutual respect. We are the most successful multicultural society in the world." The prime minister also stressed that sharing information between the country's security agencies and frontline workers - such as teachers - was important to tackle the problem. The summit is expected to discuss in detail what measures should be implemented to counter violent extremism and prevent further radicalisation. Ahead of the talks, Australian Federal Police Commissioner Andrew Colvin admitted that the problem "is getting worse for Australia, not better". "We're shocked that a 12-year-old is on the police radar for these type of matters," he told the ABC's 7.30 programme. Mr Colvin said the boy was being watched because he was part of a group of extremists who may have helped Jabar. The identity of the juvenile has not been revealed because of his age. Mr Turnbull has said the attack "appears to have been an act of terrorism". The killing has shocked Australians, amid concerns about the radicalisation of young people. Dozens of Australians are thought to be fighting with Islamic State (IS) militants in Iraq and Syria and the Australian government has introduced new national security laws in response. Experts are worried about the effect of returnees - and on those who support them - on security. In September last year, police in Melbourne shot a man they called a "known terror suspect" a day after IS called for Muslims to kill Australians.